This year’s Bayreuth festival was cast under the spell of the colour blue. Internationally acclaimed artists’ duo Neo Rauch and Rosa Loy spent six years designing the stage set for the new production of ‘Lohengrin’, in which time they gave intense consideration not only to the piece but to the entire world of opera. The result was a huge cyclorama, all in blue, made by the Leipzig opera’s workshops, which forms the centre of a captivating dreamscape. Rauch and Loy wanted to avoid presenting audiences with a pre-conceived interpretation of the action. Instead, they wanted to create a design that would allow the performance to “re-enchant the world”. From their initial visual idea, they developed a set with a voltage transformer substation in the middle of the stage. This power plant visualizes the energy that Lohengrin radiates as a knight of the Grail, in contrast to the people of Brabant, who dwell in darkness. But the set also recalls the groundbreaking significance of electricity in the 19th century as well as citing the baroque stage and the cyclorama of the ‘new’ Bayreuth. As visual artists whose usual medium is painting, Rauch and Loy are accustomed to interleaving different temporal levels. For Lohengrin, too, they wanted to create dream worlds that overlap and flow together within their own visual universe. Director Yuval Sharon then transposed these images on to his own interpretation of the piece. To him, the leitmotif in Lohengrin is the failure of utopias. Light played an important role in creating the dream landscape. It was quite a challenge, even for an experienced light designer like Reinhard Traub. He was tasked to make the enormous cyclorama, measuring 45m x 22.5m and painted in the base colour Delft blue, appear to glow. To create a 3D effect, strips of light along the horizon were separately illuminated, along with the performers and the chorus – but not with powerful spotlights. Other impressive effects included the sparks emitted by the substation and the electricity cables that glowed when ‘brought to life’ – lit up from within by LED lights. 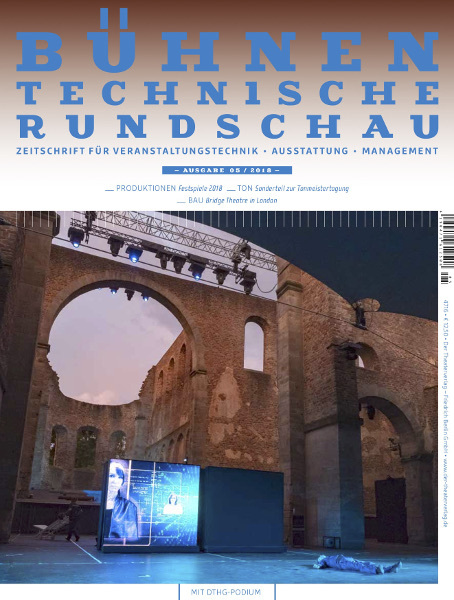 Implementing the design specifications also posed new challenges for technical director Christoph Bauch, especially regarding the huge cyclorama and the painting. The Leipzig workshops were commissioned to create the cyclorama, having previously collaborated with Rauch on a painting project and so being trusted partners. Plus, they are one of the few workshops with sufficiently large painting halls. This was the largest cyclorama they had ever painted. Additional set pieces were painted in Bayreuth by graduates of the Dresden academy of fine arts, who were chosen via a competition. As the cyclorama took up the entire hall, the painting work was scheduled for the summer break. For those involved, it was a demanding but exciting project. It’s not every day they get to work on such a gigantic format; each brushstroke measured 25cm! And 20 people were needed to heave the cyclorama on to the comparatively tiny pallet, measuring only 2m x 3m. “Beautiful, thrilling and nerve-wracking!” was how one of the young painters who spent six months painting objects for the set in Bayreuth summed up the experience.